Custom Pet Portraits: BZTAT Studios Is Off The Charts! 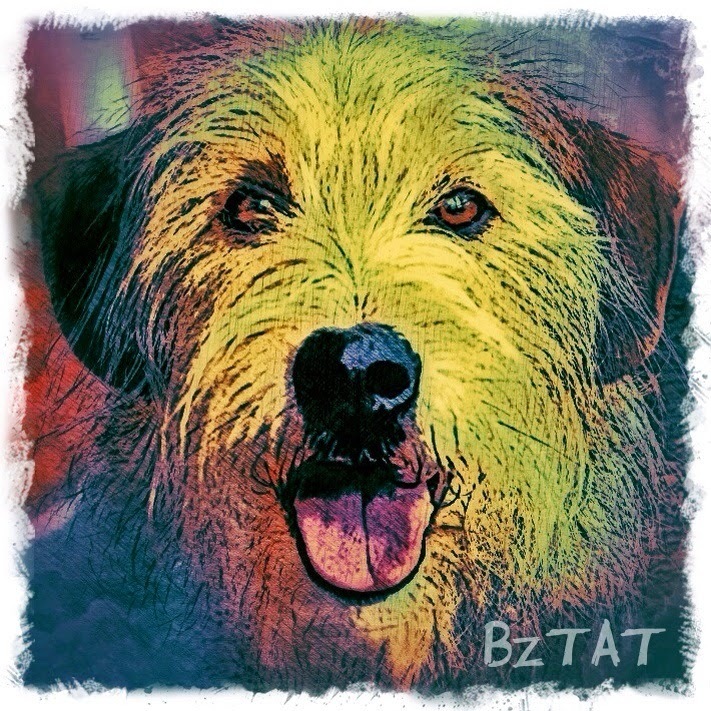 Custom digital pet portrait (of yours truly) by the famous Vicki Boatright, aka, BZTAT Studios! The artist, Vicki Boatright, is a longtime BlogPaws Community member and has attended each of the six BlogPaws conferences as their artist in residence. At this year's conference (you know, the fourth conference that I didn't attend), Parental Unit was one of the lucky winners of a digital pet portrait—see my gorgeous face above! Here's picture of the artist happily at work at one of the many BlogPaws conferences. We think this was snapped at "BlogPaws West" in Denver! And this is just one of a full line of vibrant, custom pet portraits that Vicki creates, based on a photograph of your beloved pet. At the moment, Vicki offers paintings, folk art paintings (Parental Unit is a real folk art fan and she loves Vicki's take on that genre), drawings, and digital portraits like the one above. We say, "at the moment", because artists are always moving in new directions to enrich their creations, so your best bet is to visit Vicki's website, BZTAT Studios, and take a gander at her work. But remember that it takes a decent amount of time to create a one-of-a-kind art piece, so if you're shopping for a special holiday present, now's the time to order! And while you're at it, hang out with Vicki and BZTAT Studios on her social media channels, but for a comprehensive look, check out her Pinterest Boards—they're spectacular! Thanks so much for our gorgeous digital portrait, Vicki. We both love it! Bocci it is brilliant. We love it. Have a fabulous Friday. Gorgeous, thanks for sharing! Happy Friday!! We love your digital portrait, Bocci! It's fabulous!